Chronicle screenwriter Max Landis has his own Superman comic now, and while it treads on familiar ground, it promises to be like no other: seven snapshots from Clark’s life as he learns to deal with his superpowers and learns to become a superhero. The first issue leans into the similarity a little too much, but it’s a promising start. Spoilers ahead for Superman: American Alien #1, by Max Landis, Nick Dragotta, and Alex Guimarães. As I said, the exploration of Clark Kent’s formative years’ is hardly new ground for DC to break—there have been untold stories of the boy who would become the Man of Steel, of how Clark learned about and adapted to his strange world of alien superpowers in rural Kansas. But as Landis’ first issue (of seven, each focusing on a different time in Clark’s life and using a different art team) has a sense of freshness to it that is, unsurprisingly, very Chronicle-esque. The first issue deals with Clark discovering his powers of flight, and that he can’t control them. There’s a sort of quasi-realistic approach to the power in the issue as it develops from a sort of uncontrollable rise from the ground (usually when Clark is stressed) to an eerie float that feels very much like the way Landis and Josh Trank visualized the psychic powers of the teen heroes in Chronicle—especially in the way Dragotta almost always frames Clark’s flight in such a way to highlight the abnormality of it, the fear that’s laden in it as he struggles to control who he is. Like I said, it’s not the first time we’ve seen stories like this, but Landis does his darnedest to emphasize the alien-ness of the young Clark’s life. Part of that is aided by giving us a surprisingly thoughtful young Clark Kent. Before he finally masters his flight near the end of the story (in a slightly ham-fisted moment that sees a ripped shirt become a red cape) Landis really nails young Clark’s fear at being different and not being able to control what his body is doing to himself. He’s depressed, worried, scared of his own alien identity. It culminates in a moment when, having watched an alien invasion B-movie with his friends, Clark glances at a mirror and sees not his own reflection, but a horrifying alien creature. He smashes the mirror—and the wall behind it—in fear, and it’s a wonderful moment of vulnerability that really works. DC’s current approach to Superman is to show that he isn’t a godlike figure, that he can be vulnerable, but the publisher is doing this by stripping away layers of the Superman ethos. In the current comics universe, Superman’s identity is exposed and his powers are diminished as DC attempts trying to show Superman’s vulnerability by lessening him as a hero. It doesn’t quite work like that. By going back to that familiar ground of the young Clark, Landis gets that vulnerability right: it becomes about Clark’s own insecurity and fear, and overcoming that personal struggle. The vulnerability becomes part of his evolution as a character, rather than a devolution for the sake of a new storyline. 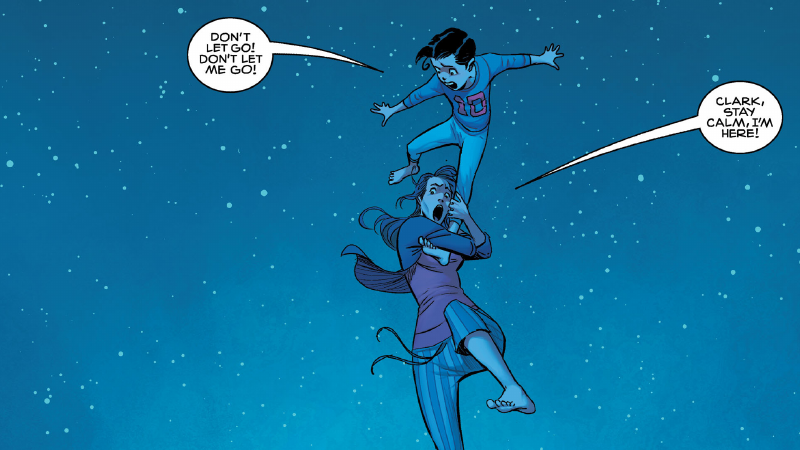 It’s almost a shame that American Alien will go on to depict other parts of Clark’s life, because I kind of want to see a lot more of kid learning to live with himself than I do the actual part where he’s Superman.